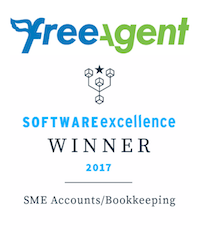 FreeAgent has been voted for as the UK’s #1 accounting software for small businesses and is included in all the packages we offer. Carry on reading to find out exactly why it’s so great, and why choosing Sidekick to manage your finances might be the best decision you ever make! FreeAgent have been recognised and awarded for many of their efforts since starting business in 2007. Last week, FreeAgent was named “best new innovation in solving problems for small businesses using account aggregation” at the Financial Data and Technology Association (FDATA) 2018 Open Banking Awards, which recognise the many innovative ways UK companies are using Open Banking to help their customers. Ever since they received our Account Information Services Provider (AISP) registration from the Financial Conduct Authority earlier this year, they’ve been working hard on bringing Open Banking into FreeAgent, so they were honoured to receive this recognition. But that’s not all! FreeAgent also had a successful night at the recent 2018 Computing Technology Product Awards in London, where they were named Best Business Software Provider. And earlier this month, their co-founder Ed Molyneux was delighted to be crowned CEO of the Year at the Scottish Tech Startup Awards. 2019 is gearing up to be an even bigger year for FreeAgent and Sidekick looking forward to continuing to work hard to provide the best services to our clients. FreeAgent encrypt all transactions between you and us with 256-bit SSL technology. Everything together in one place- FreeAgent’s Dashboard brings together your invoices, expenses, bank accounts and more, helping you keep your business on the right trajectory. Tracking cash flow is a top priority for any business. FreeAgent’s cash flow view gives you a monthly snapshot of the money coming in and going out of your business, so you know if you’re making or burning cash. See which invoices have been paid, are due or overdue – so you know what money you’re owed and who you need to chase up. No need to run a report – find out exactly how much profit you’re making this year in an easy-to-read snapshot view. Never miss another tax deadline – see your upcoming dates for Self Assessment, VAT, Corporation Tax and Payroll, and even how much you need to pay. Export the timeline to your own calendar to avoid any nasty surprises. FreeAgent are included in every single one of our packages available starting from just £35 a month. Contact Sidekick today to find a package that suits you and revolutionise your accounts with the FreeAgent app.